Final Radio Transmission: 7:15 pm "We are holding our own"
For 17 years the Fitzgerald hauled taconite iron ore from mines near Duluth Minnesota to iron works in Detroit Michigan, Toledo Ohio and many other ports. When launched she was the largest ship on the Great Lakes and remains the largest shipwreck of the Great Lakes as well. The Fitz set 6 seasonal load records often at times breaking her previous record. The Captain was well known for blaring music loudly over the PA system and giving commentary about the ship to entertain spectators along the Soo Locks and while passing through the St. Clair and Detroit Rivers. On November 10 th 1975 the S S Edmund Fitzgerald and the S S Arthur M. Anderson met near hurricane force winds and waves of up to 35 ft while on route to a steel mill near Detroit. Shortly after 7:10 pm the Fitzgerald sank and spotters from shore could no longer see her lights above the waves. She sank in Ontario waters 530ft deep, approximately 27 km from whitefish bay. The sinking led to changes in Great Lakes shipping regulations and practices that include mandatory survival suits, depth finders, global positioning systems, increased freeboard, and more frequent inspection of vessels. 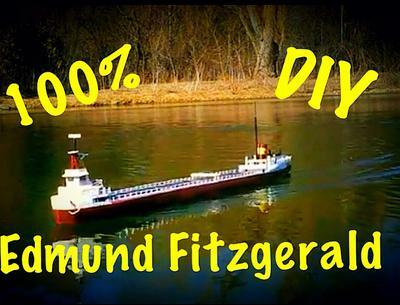 The Fitzgerald was also used as a Luxury Liner carrying high profile passengers across the Great Lakes and even has a famous song written by Canadian artist Gordon Lightfoot "The Wreck of the Edmund Fitzgerald". The exact cause of the sinking is still unknown and a mystery to this day and many theories still get argued upon between professionals. 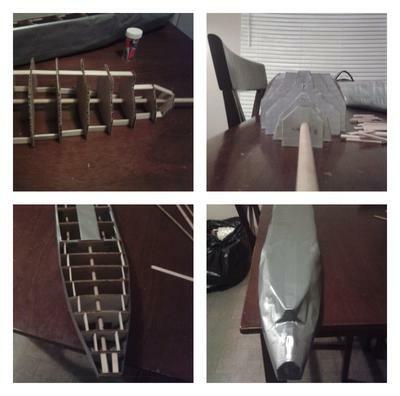 The hull mold I made out of corrugated cardboard and held the ribs in place at 1" intervals using wooden doweling. I then covered the outside with 2 layers of duct tape to give the shape I wanted. I created the hull by covering the mold with Fiberglas cloth x2 and coated with resin. Once cured I cut out the final details and sanded the entire hull to remove the wax layer from the resin. The main deck, cabin decks and cabin roofs are all made with 1/4" plywood. The cabin walls I made by cutting, folding and gluing cereal box cardboard and coating with Fiberglas resin once glued to the deck. 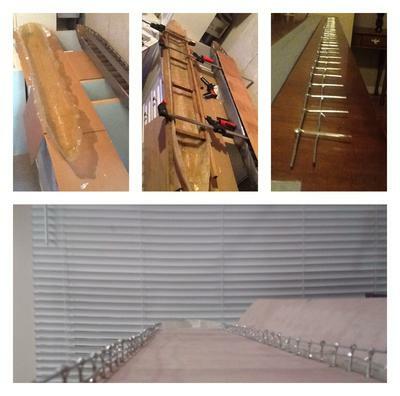 The railing on the main cargo deck are made using cotter pins and soldering on steel tying wire (20 ga). The cabin railings I used cotter pins again but instead used twine and treated it with super glue to keep in place. Overall I like the look and neatness of the twine over the soldered railing and the twine was a lot less labour intensive. The mast and other details I made out of wood skewers, wood dowel and a straw to conceal wires for the light. Both mast and radar tower have a white light at the top, the rear cabin has a red and a green navigation light on the roof top and the wheel house has a light inside the cabin and plexiglass windows to keep it sealed. There is a smoke machine that runs off baby oil and actually produces thick smoke out the stack. The smoke machine and lights both have their own power supply along with a manual on/off switch. The electronic speed control, receiver and servo all run off the same battery. Controller is a 4 channel controller/receiver and I plan to hook up a horn and a bilge pump in the future. The stern cabin slides forward and lifts off to allow access to prop shaft, servo, smoke machine and motor and a section of deck removes to expose the ESC, receiver, battery packs and on/off switches. I sealed the entire perimeter between hull and decking with hot glue and also created a gasket around the section that removes to keep my electronics dry. The prop shaft and rudder shaft are both sealed using stuffing tubes I made by soldering pieces of an old antenna and reinforced them with 3 layers of Fiberglas cloth and resin to ensure a strong hold. 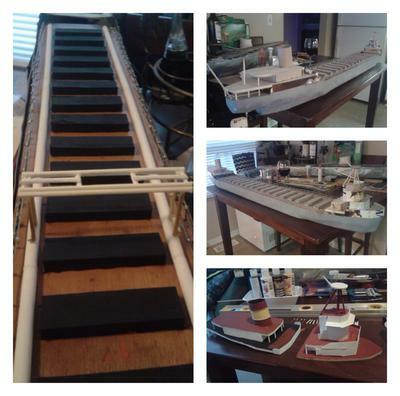 The entire ship I painted with Art Deco acrylic paint and sealed with 4 heavy coats of krylon automotive clear coat. It is by no means a museum quality build but for a completely scratch built model from blueprints I found online and pictures it sure looks good. Now time to build a tug! If you care to watch a video with pictures during assembly or video of the maiden voyage search my YouTube channel "Ontario Backwoods Outfitters" and there are a couple in the hobbies and interests playlist. Esc is a 60A/250A peak waterproof Esc, motor is a 45 turn brushed 550, prop shaft is 2mm, battery for Esc and servo is a 7.2v 1800 mah Nicd, battery for smoke machine is 7.2v 1600 mah nimh and battery for LED lights is a 4xAA battery holder. I didn't mind the battery weight since I still had to add 26 lbs of ballast and had to separate the smoke machine and Esc/servo since when they ran on the same power my servo would glitch and shutter. LEDs I put on own power source so they don't dim when I hit the throttle. Eventually the smoke machine battery will power a horn as well. Total cost for this build was $276 Canadian which isn't much these days [lol] and build time spanned over the winter months. Headed over to your utube next.